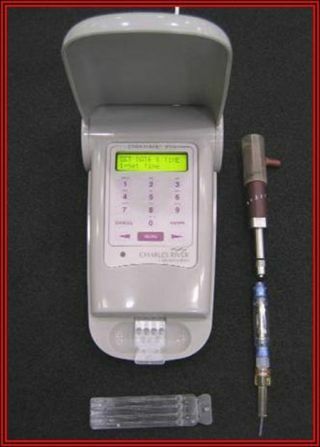 The LOCAD-PTS Reader, cartridge (below Reader) and swabbing unit (to the right). These three components are all that is required to collect a surface sample, dissolve and analyze it to obtain quantitative levels of endotoxin, glucan and lipoteichoic acid. Astronauts recently had their gloves swabbed in an earlyeffort to develop planetary protection measures that prevent humans fromaccidentally contaminating the moon or Mars on future missions. The crew of space shuttle Discovery and the InternationalSpace Station used a new laboratory device to examine biological material onthe gloves of astronauts servicing the space station. Such tests could helpNASA understand and plan around how to prevent the spreadof Earth life to other planets. "This simple approach, designed to monitor the spreadof biological material in space, takes very little crew time to perform andcould prove to be a useful step in planning future human missions to the moonand Mars," said Jake Maule, a geophysicist with BAE Systems. The space station's Lab-on-a-Chip Portable Test System, orLOCAD-PTS, can rapidly detect and identify a variety of biological materialsrelating to bacteria and fungi, and has been on the space station since March2007. A recent spacewalk on March 19 provided the opportunity forastronaut Sandy Magnus to swab the spacesuit gloves of STS-119 missionspecialists Steve Swanson and Richard Arnold, both before they exited the spacestation airlock and after they returned. The spacewalkers installed a solar array truss segment (S6),which had been sampled and analyzed with LOCAD-PTS prior to launch withDiscovery on March 15. NASA clean room procedures ensured that most surfaces ofthe hardware remained clean, but the lab device did detect small levels offungi — especially in the fabric gap spanners, or safety elements that connecthandrails and allow astronauts to move safely around the outside of the spacestation as they work. Dead or live bacteria or fungi that remained on the S6segment would have likely ended up on the spacewalker gloves. An analysis byLOCARD-PTS will likely turn up results after the space shuttle undocks for thejourney home. "These guys were the first guys to put their hands onit since it?s been in space, so we were swabbing their gloves and so we?ll knowwhat?s just out there in space versus when we go looking for life on otherplaces," said Tony Antonelli, shuttle pilot for Discovery. Any life that survives in space may also evolve inunexpected ways. Studies from two recent space shuttle missions showed that Salmonellabacteria, which cause food poisoning on Earth, becamemore virulent in the space station's microgravity environment. Tinycreatures called water bears have also demonstrated the ability to surviveexposure in the harsh vacuum of space. LOCAD-PTS should help develop procedures and tools to keepan eye on biological contaminants that might creep aboard expeditions to themoon or Mars, said Mike Effinger, a LOCAD project manager at NASA's MarshallSpace Flight Center in Huntsville, Ala.
"Because spaceflight currently is limited to low Earthorbit, requirements don't exist yet in regard to biological contamination ofother planetary surfaces by human missions," Effinger said. "Thisstudy seeks to begin development of test procedures that can be furtherdeveloped on the moon in preparation for the humanexploration of Mars."